Viburnum odoratissimum commonly know as ‘Sweet Viburnum’ is a fast growing evergreen species well suited a large dense screening plant or hedge. Reaching around 4-5 metres depending on conditions. A number of forms exist some with glossy foliage ‘Awabuki’ and others with more of a ‘matt finish’. All have fragrant flowers that appear in spring to early summer followed by small red berries. V. Odoratissimum ‘Emerald Lustre’ is perhaps the most commonly used. With dense foliage this a great plant for screening a fence or growing as a hedge. V. odoratissimun prefers full sun to part shade, a well drained humus rich soil and a cool root run, so mulch is a good idea. As they take well to pruning ‘Sweet Viburnums’ are suited to use as hedging plants in a formal or informal style. When planting dig in some well rotted compost and aged manure, water in well with a seaweed fertiliser. An application of slow release fertiliser in spring seems adequate. Once established this is a reasonably drought tolerant plant but they do like a little moisture, especially during extended dry periods. Excellent screening or hedging plant. Useful when grown as a background plant in the garden border. Also used as a stand alone plant in the border. Description. 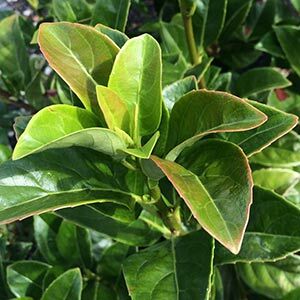 Evergreen shrub used as a hedging plant. Glossy green foliage and clusters of white flowers in spring. Height – 4m – 6m. Usually pruned to 3m -4m as a hedge. Full sun to a little shade, not suited to deep shade. Better for warmer climates than other Viburnum varieties. Fertilise in spring with a general purpose slow release fertiliser.